Matt Hohmann (above) scored game-winning goal. 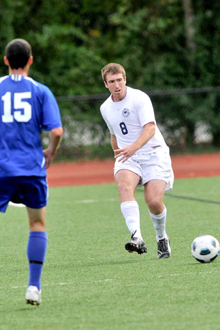 The Judges ruled Saturday on the soccer pitch for Brandeis teams, as both the men and women advanced to Sunday action. The women earned their first-ever NCAA Division III tournament victory with a 2-1 come-from-behind win over Castleton State, thanks to goals from first-years Mary Shimko and Hilary Andrews. Coach Denise Dallamora's squad will take on Williams tomorrow at 1 p.m. in the second round. On the men's side, Brandeis upset top-seeded Bridgewater State, 3-0, in the semifinals of the ECAC Division III New England tournament. Coach Mike Coven's squad got a late first-half goal from senior back Matt Hohmann, the first of his career, to lift the Judges into a Sunday date with second seed and host Western New England College. The Brandeis women, ranked 23rd nationally, improved to 15-4-1 on the campaign and will face ninth-ranked Williams after snapping Castleton State's 14-game unbeaten streak. In the first half against CSC, Brandeis owned a 13-3 advantage in shots and 4-0 edge in corner kicks, but it was Castleton State that tallied first. The Spartans got on the board at 9:48 thanks to the high-scoring combination of juniors Courtney Chadbourne and Hilary Cooke. Chadbourne sent a laser beam of a cross from the right sideline through the box, where Cooke's head was waiting to deposit it in the back of the net. Brandeis responded less than two minutes later on the first of two goals by rookies when junior midfielder Alanna Torre of Weston, Fla. sent a ball toward the net. As it bounded toward the goal-line, midfielder Mary Shimko of Bay Village, Ohio was there to put it home for her second goal of the season at the 11:42 mark. The Judges controlled play the rest of the way in the first half, but Castleton State sophomore Ericka Davis came up big, making seven saves to keep the game knotted, including a stop in the 36th minute when she kept a ball by junior back Ali Maresca of Wyckoff, N.J., from just trickling over the line. After Davis made two more saves early in the second half, the Judges broke through with the game-winner at the 71:06 mark. Senior forward Sofia Vallone of Weston, Conn. put a free kick from about 35 yards away on net. Davis made the initial save, but in the ensuing scramble, senior forward Tiffany Pacheco of Rehoboth, Mass. sent it across the goal mouth, where rookie reserve forward Hilary Andrews of New Bedford, Mass. knocked it home for her third goal of the season and what proved to be the second game-winner of her career. The assist was the 29th of Pacheco's career, setting a new Brandeis program record. Falling behind for the first time in the contest, CSC turned up the pressure, but Brandeis sophomore goalkeeper Francine Kofinas of Dix Hills, N.Y., made two saves against CSC junior midfielder Brandy White, one on a corner kick and another on a free kick, to preserve the lead. Kofinas finished the game with three stops, while Davis had 11 saves for the Spartans. Tomorrow's second-round matchup will be the first-ever between Brandeis and Williams. Kickoff is at 1 p.m. and tickets cost $3 for students and $6 for adults. The men's soccer team will have a chance to win the third ECAC Division III in program history tomorrow, as the fourth-seeded Judges upset top-seeded Bridgewater State University, 3-0, at Western New England College. The Judges improve to 11-7-1 and will face host and second-seeded Western New England College tomorrow at noon in the championship match. After nearly 40 scoreless minutes, the Judges broke through just before halftime. At the 39:39 mark, sophomore forward Evan Ersing of Beverly, Mass. found senior back Matt Hohmann of Weymouth, Mass. at the edge of the box. Hohmann ripped a shot into the top left corner of the goal. It was the first career goal and points for Hohmann, who was playing in his 62nd career game. Brandeis doubled the lead in the 53rd minute, when rookie Kyle Feather of Pinebrook, N.J. cleaned up a rebound in front of the net for his third goal of the season. Sophomore midfielder Joe Eisenbies of Hingham, Mass. added an extra insurance goal in the 84th minute on an assist from rookie midfielder Nick George of Bangor, Maine. For the game, Brandeis outshot Bridgewater State, 17-8, though the Bears owned a 5-1 edge in corner kicks. Brandeis senior Taylor Bracken of No. Andover, Mass. had four saves to record his fifth shutout of the season and the team's ninth. Brandeis will attempt to win its third ECAC crown tomorrow to go along with titles from 2006 and 1994. The Judges also reached the finals in 1995 and 1996.